A friend and I were recently chatting, and the conversation turned to food. Is it me, or do all conversations inevitably lead to food? It may just be me, but it’s one of my favorite topics, and eating is something we all have in common. Anyway, she was looking for some new dinner ideas… but there were parameters- suggestions had to be kid friendly, accommodate allergies, and be on the table quickly. 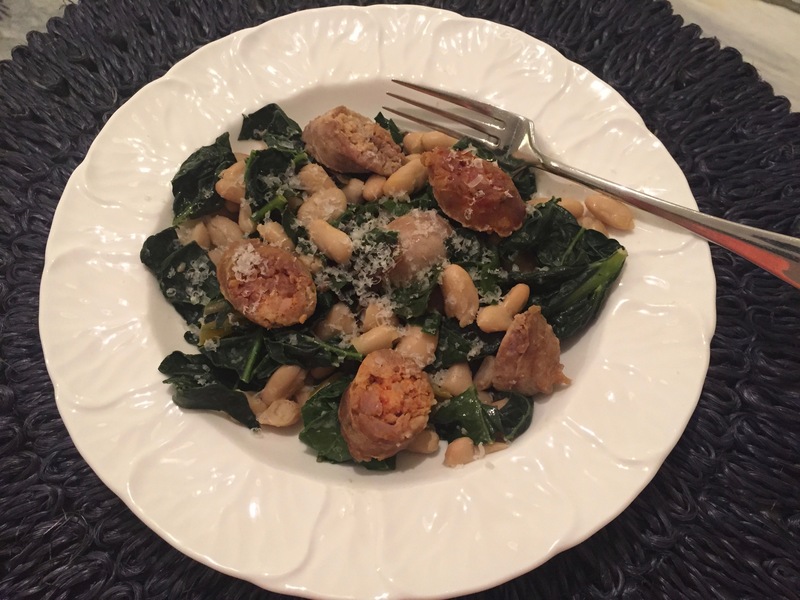 Immediately, one of my favorite go to meals came to mind, Italian Sausage, Beans, and Greens. There are several reasons why this dish ticks so many boxes in the “pro” column. It’s delicious, done in 30 minutes, needs only a few basic ingredients, and is so flexible in terms of those ingredients. 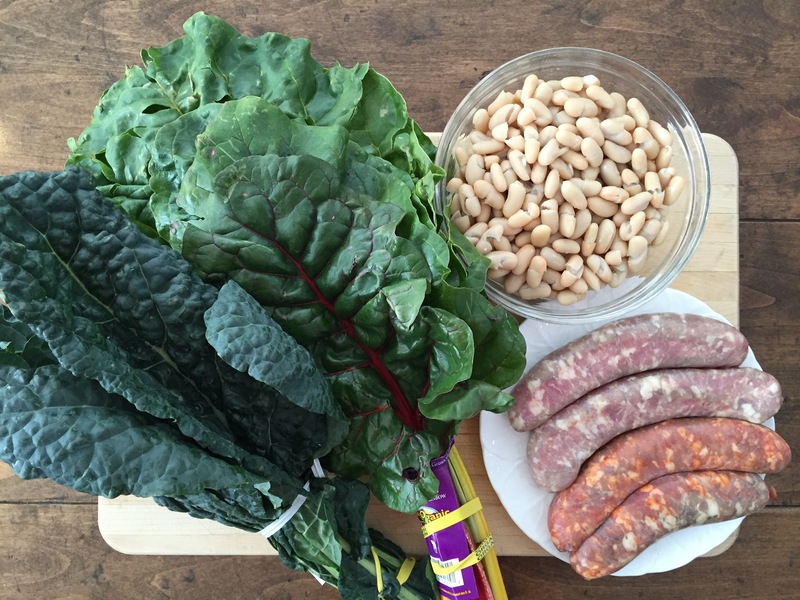 The basics include Italian sausage, cannellini beans, and greens. I make this with Italian pork sausage, but feel free to use chicken sausage or turkey sausage. 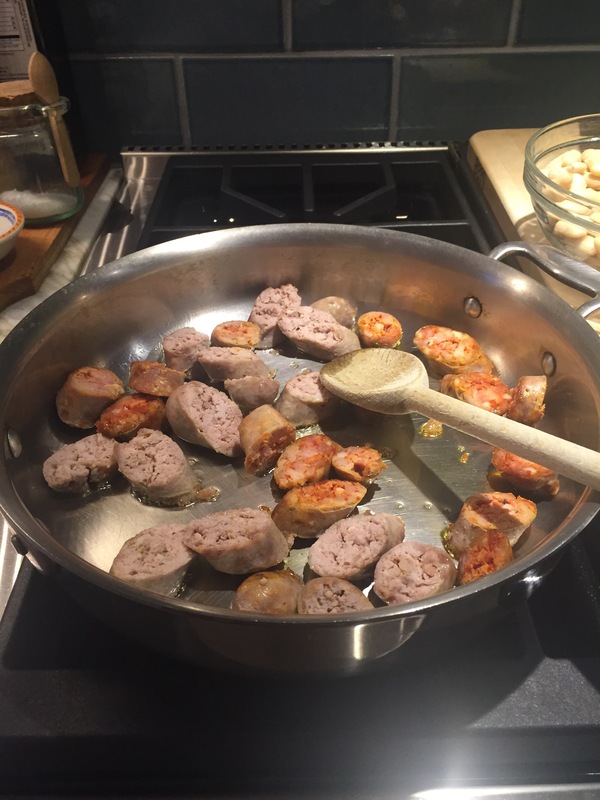 The beauty of using Italian style sausage is that it has all the seasoning you’ll need- other than any salt and pepper added to taste at the end. Cannellini beans are easy to have on hand, I usually have a few cans in the pantry. 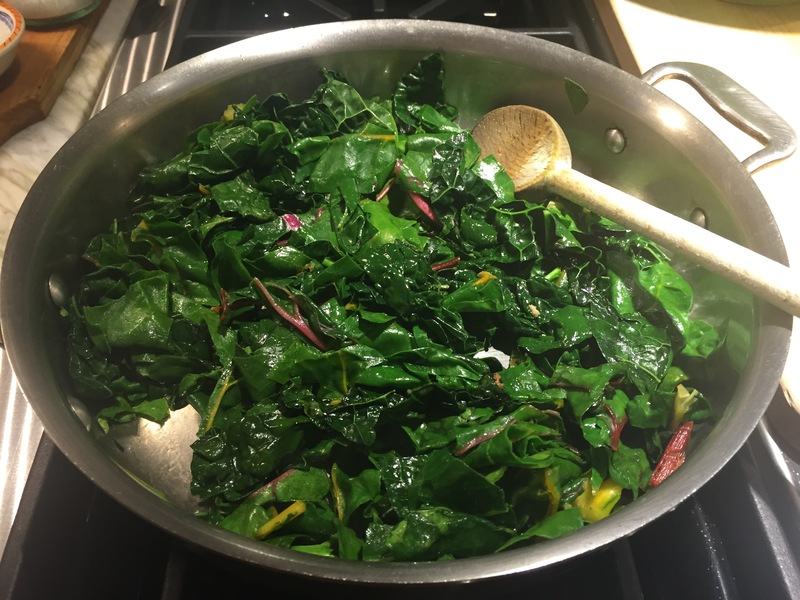 The greens I use depend on what’s available; kale, chard, spinach, arugula, rapini, mustard greens, and dandelion greens all work really well. Stick with one type or combine your favorites. Even the measurements are just guidelines. Add more or less of the sausage, beans, or greens. There is plenty of room to play in order to suit your tastes. It’s all good! Do you have favorite recipes that immediately jump to mind when someone asks, “What are you making for dinner?” What makes a dish one of your “go to” meals? 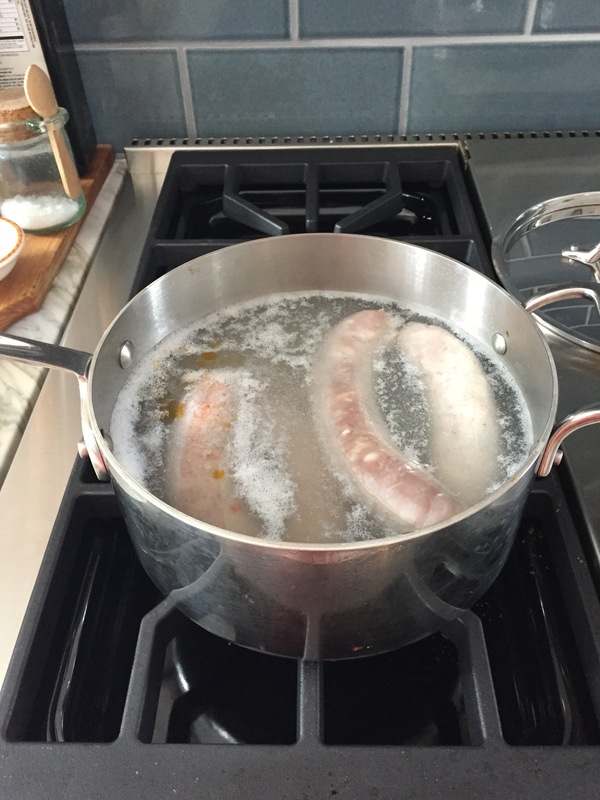 In a large saucepan, parboil the sausage links, about 5 minutes. While the links are parboiling, I carefully prick them to release the liquified fat that has accumulated under the casings. Remove from the water, cool slightly and slice crosswise into ½-inch pieces. Heat olive oil in large sauté pan over medium heat. When oil is shimmery, add sliced sausage. Be careful! There will be some splattering. Sauté sausage on both sides until brown, approximately 5 minutes. Remove sausage and set aside. Return sauté pan to burner, lower heat to medium low and add greens. Stir to coat in any oil or sausage bits remaining in pan. Cover and cook until wilted, 2 minutes. 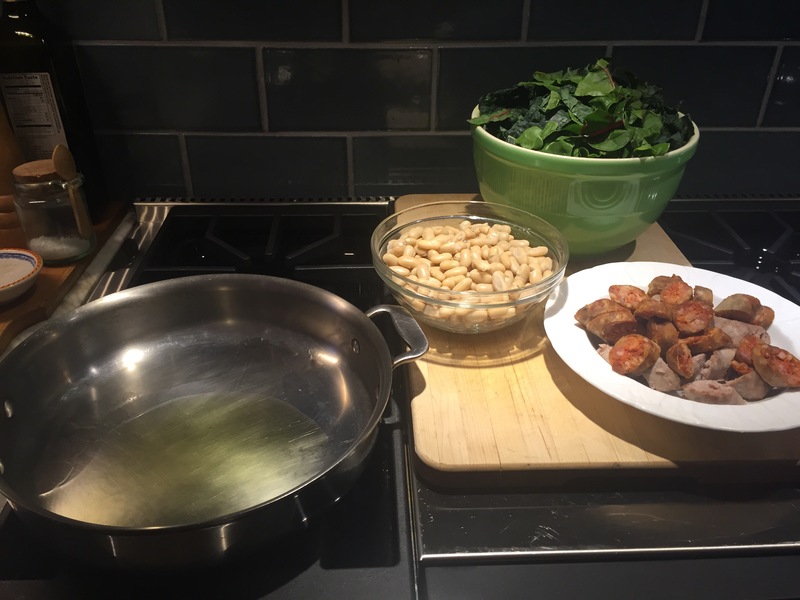 Add cannellini beans to wilted greens and stir to combine. Add sausage back to pan and heat everything through. Season to taste with salt and pepper. Serve immediately with crusty bread, passing parmesan for grating. Parboil the sausage. Carefully prick them with a fork to release liquified fat under the casings. 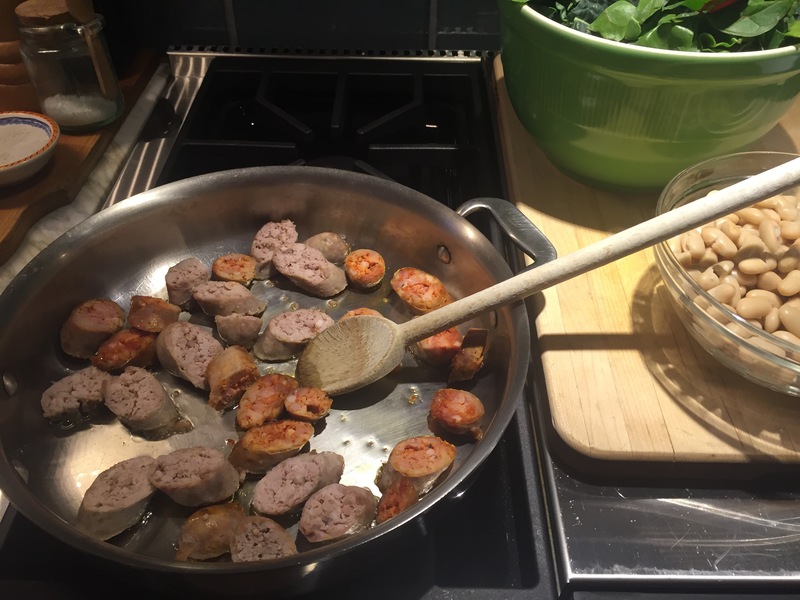 Remove parboiled sausage to cutting board. Cool slightly. Slice sausage into 1/2-inch rounds. In large sauté pan, heat olive oil over medium heat. Add sliced sausages to sauté pan. Be careful, they will splatter! Continue to sauté sausage until brown on both sides, 5 minutes or so. When brown, remove sausage and set aside. Add greens to sauté pan, stirring to coat with any oil or sausage bits left in pan. Reduce heat to medium low, cover, and cook for approximately two minutes, or until greens are wilted. 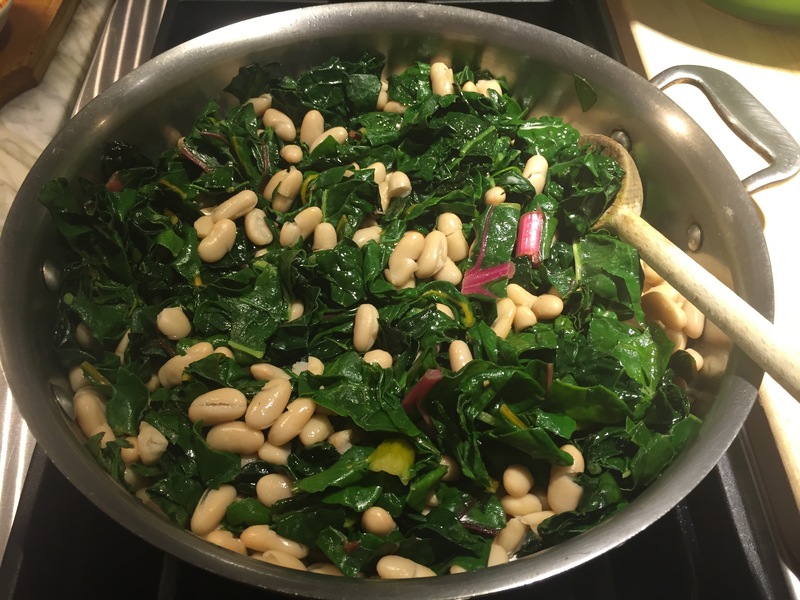 Add cannellini beans to the wilted greens and mix well. Add reserved sausage and heat everything through. Salt and pepper to taste. Serve immediately with crusty bread and parmesan for passing. Love this Jean! I may try it tonight. I’ve already made your Chili Con Carne twice. The family loves it and I love that this recipe and the Chili are gluten free!! One of my favorite recipes that I find easy to make is Ina Gardner’s Mac-n-Cheese. To make it gluten free I use the Barilla GF noodles, sprinkle with GF bread and bake for 30min. It’s quick, easy to make and everyone finds it tasty. I served it on Christmas Eve with the ham and noone new it was GF. In fact I think I’ll be making your chili and Ina’s Mac-n-Cheese for the Pats game on Sunday!! GO PATS!!! Thanks, Kim! So glad you like the chili! I never thought to make Chili Mac, but that is a fantastic idea (especially if you found a gluten free version that you like). 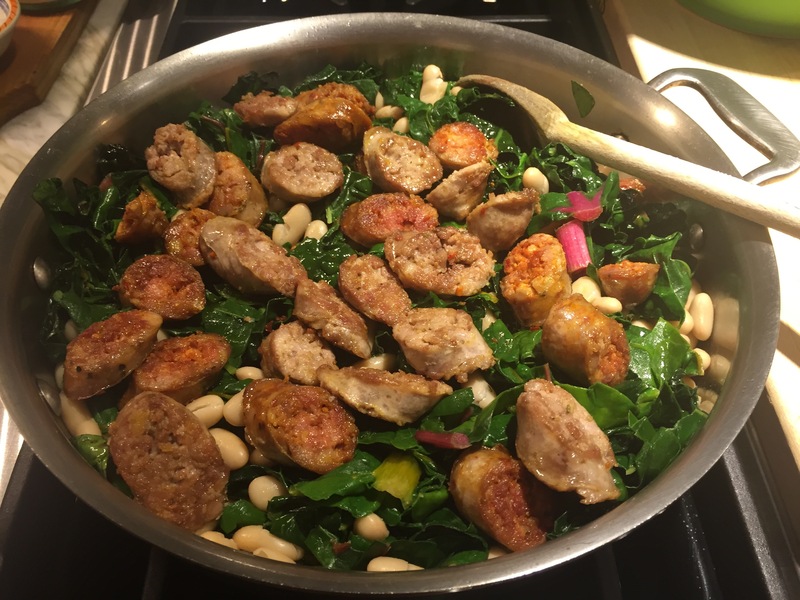 Hope the Italian Sausage, Beans, and Greens is met with the same success! Yes I can’t believe it is so easy and I like that! I also like the greens which I am bad at incorporating! So a big winner for me! Hahaha! A bag of crisps it is then! Chili can wait… 🙂 Thanks for stopping by, Dublin! Now thats a beautiful meal. I need to really cut down on carbs this is exactly what I need to make. Delicious. It really is a humble dish, only 3 main ingredients but so satisfying! Thank you, Suzanne. I was more than happy to stop by. Yes, all conversations lead to food. I mean eventually our tummies are grumbling, right? This looks delicious! Excellent. Very healthy too. I’m very impressed with the simplicity of the dish. Thanks, Conor, that means a lot coming from you! Simplicity is key on weeknights! What a lovely looking dish! Definitely adding that to my must-try recipes. This looks absolutely amazing! 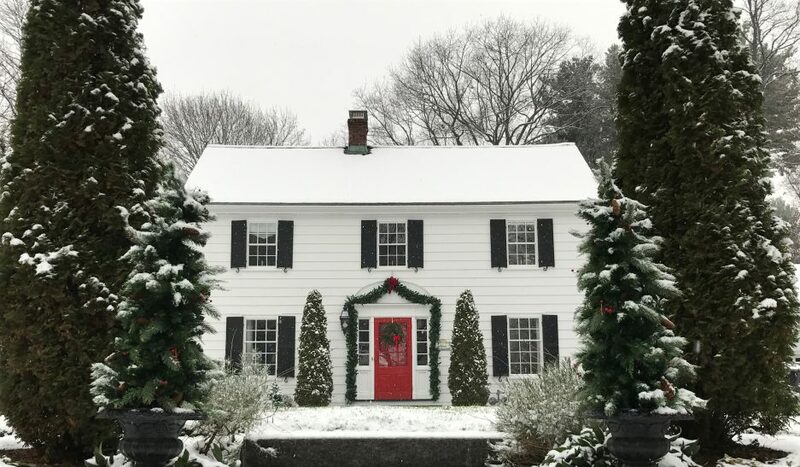 This is something I know my family would love! Thank you so much, Nicky! I hope you give it a go! Happy to meet you, too! We have been traveling in the same circles but missed each other. So glad we’ve fixed that! Thanks! This dish is fast, healthy, and fills you up on a cold night! Simple yet delicious! What’s not to love? Thank you! Awfully kind of you! 🙂 🙂 Thank you, Linda!